You are standing at the edge of The Plain, the eastern approach to the city centre. 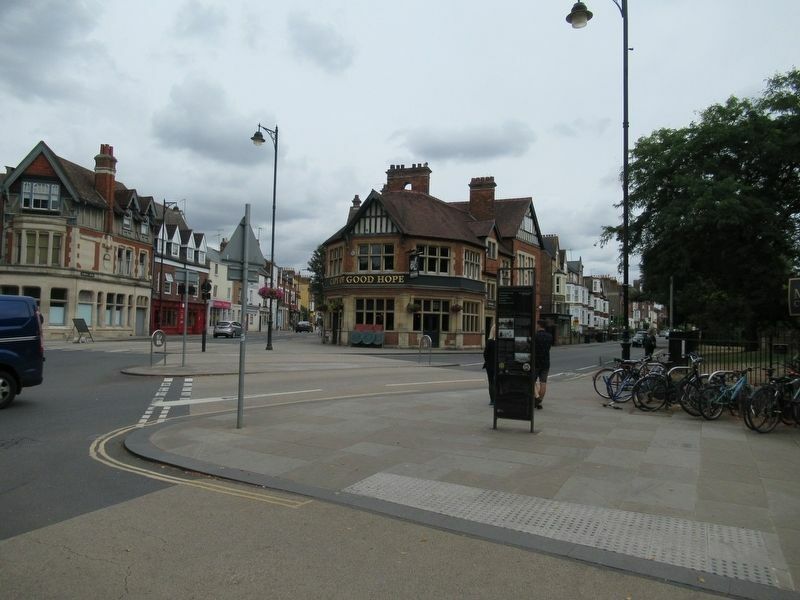 On the traffic island is the Victoria Fountain, built in 1899 where the toll-house once stood. Behind you is the 18th-century Magdalen Bridge over the River Cherwell. Across the bridge you can see the imposing 144 ft tower of Magdalen College, begun in 1492, Opposite the tower is the Botanic Garden - the oldest 'physic garden' in Britain. revellers gather to enjoy the spectacle. The Plain was created after St Clement's Church was demolished in 1830; the roundabout occupies part of the churchyard site. Three roads converge here: Iffley Road, Cowley Road and St Clement's, the main route from London. Had you arrived at this spot in the 13th century, you would have crossed a wooden bridge (built in 1004) to reach Oxford's East Gate (now demolished). The recently restored Victoria Fountain was funded by the Morrell brewing family and once provided drinking water for thirsty travellers — and their horses! The Latin inscription reads (in translation): ‘The water drips, the hours go by; Be warned, drink, catch them ere they fly'. The buildings behind you are part of Magdalen College School, a boys' school founded alongside Magdalen College in 1480 which moved to this location in the late 19th century. Further along Cowley Place is St Hilda's College (founded 1893), one of five former women's colleges all of which are now co-educational. Magdalen Bridge was built in 1771-8 to the designs of John Gwynn, the architect of Oxford's Covered Market. 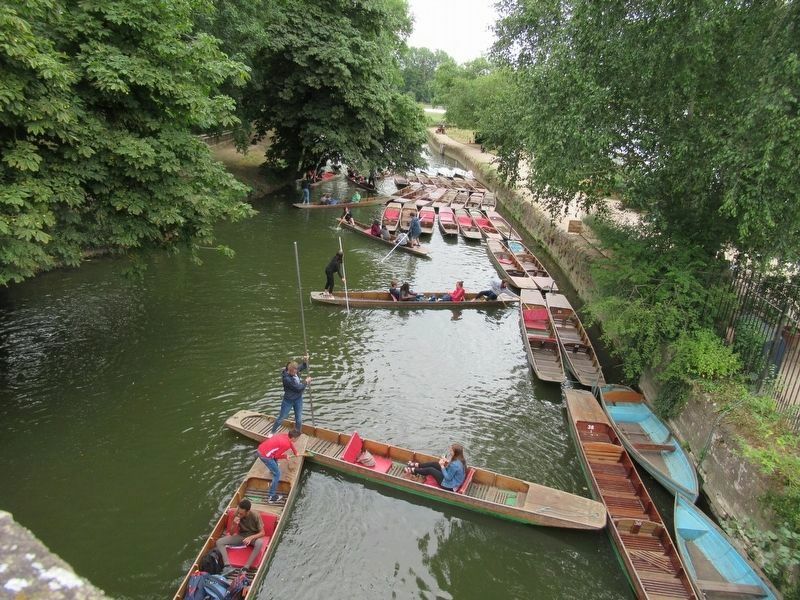 On the riverbank beneath the bridge you can hire a punt or boat to explore the Cherwell or the Thames. 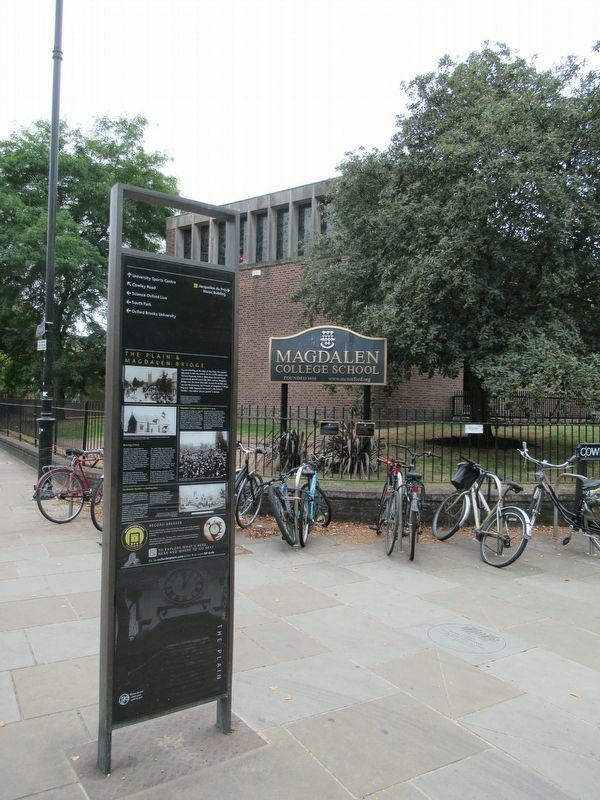 Opposite Magdalen you will find the oldest botanic garden in Britain. It was established in 1621 on the site of the Jewish cemetery to provide plants for medical research. The garden is entered through a richly embellished classical gateway, beyond which are cultivated over 7,000 types of plant from all over the world. It has been a source of inspiration for many Oxford writers; in Evelyn Waugh's Brideshead Revisited, Sebastian Flyte tells Charles Ryder, "I don't know where I should be without the Botanical gardens", and more,recently, in Philip Pullman's His Dark Materials, Lyra and Will agree to meet in the garden each year on midsummer's day. The first man to cover a mile in less than four minutes ran it at the University track on Iffley Road. The runner was Roger Bannister who had been a student at Oxford. High winds on race day – 6th May 1954 – almost stopped him running. But in front of a crowd of 3,000 he powered home in 3 minutes 59.4 seconds, smashing the four minute barrier. - Magdalen Bridge, Oxford. A procession of the Ancient Order of Foresters passing over Magdalen Bridge in their decorated carts. The Order was established in 1834 to provide financial support to members in times of hardship. - St Clement's Church, Oxford. An illustration of the old church showing the small bell turret at the west end. Photographed by H. Taunt, 1907. - Magdalen Bridge, Oxford. A crowd of people gathered on Magdalen Bridge on May morning. Photographed by H. Taunt, 1900. - An old painting showing a view across the Botanic Garden, with people strolling along the walkways and Magdalen College tower in the distance. Location. 51° 44.992′ N, 1° 14.654′ W. Marker is in Oxford, England, in Oxfordshire. Marker is at the intersection of Cowley Place and The Plain, on the right when traveling north on Cowley Place. Touch for map. Marker is in this post office area: Oxford, England OX4 1EA, United Kingdom. Touch for directions. Other nearby markers. At least 8 other markers are within walking distance of this marker. Victoria Fountain (within shouting distance of this marker); The Early University (approx. 0.7 kilometers away); Christ Church (approx. 0.8 kilometers away); The High Street (approx. 0.8 kilometers away); Radcliffe Square (approx. 0.8 kilometers away); George Claridge Druce (approx. 0.8 kilometers away); Christ Church & Its Meadow (approx. 0.8 kilometers away); Reredos Memorial (approx. 0.9 kilometers away). Touch for a list and map of all markers in Oxford. More. Search the internet for The Plain & Magdalen Bridge. Credits. This page was last revised on March 22, 2019. This page originally submitted on March 22, 2019, by Michael Herrick of Southbury, Connecticut. This page has been viewed 25 times since then. Photos: 1, 2, 3. submitted on March 22, 2019, by Michael Herrick of Southbury, Connecticut.